It’s less than a week to the camp up at Mount Ophir and we’re finally experiencing the “fire in the pants ” feeling. “What’s for dinner? What are you bringing for the camp?”. Ahh, the familiar questions pop up and yours truly was no different. All I had in mind was the type of cooking and food we needed to bring. Absolutely no toots about tents, sleeping bags, bungee cords, lights. Only food and what to cook it with. If food’s all you’re thinking about, you meet an important criteria for Kruzer membership. Sensing that people might be sleeping out in the open with stars for cover, it would be apt to do some thinking or “research” into motorcycling and camping: 2 things that come naturally together. 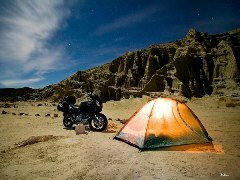 If you’ve done your homework, you’ll notice that all motorcycling and camping articles naturally lead to one article: Bill John’s Excellent Motorcycling Camping Guide. Kruzer 7th Anniversary.. at Fraser’s Hill! Kruzer presents "ONE CRAZY RIDE"
Hi This is a wonderful outdoor site and found the entry helpful,this will improve my fishing particularly where I like to go fishing,smallmouth are the most fun in this waterway and active when the turbines are on,I use a multiple amount of live and artificial bait then figure out what will work that day.